Many dogs don’t do well home by themselves while mom and dad are out at work. On top of it, many dog owners feel guilty about leaving their pups at home all day every day. Doggy day care locations and enrollments have surged in recent years as pet owners look for ways to give dogs social outlets that get them tired while keeping them emotionally happy. Not every dog is suitable for doggy daycare. It might seem like the perfect place for mental stimulation, socialization and exercise for man’s best friend, but some dogs just don’t do well in a daycare facility. Other dogs just need a bit of time to get used to the daycare. And there are those who just jump on in and become part of the pack, if not the de-facto leaders of the pack. Consider your dog’s temperament before considering doggy daycare at all. Not only will this determine if your dog should be enrolled, but it will also govern the type of facility you choose for your dog. As pack animals, dogs have natural tendencies that lean either as a dominant or submissive personality. A dominant dog usually doesn’t fear going to the facility but you need to fully understand how he reacts with other dogs. Becoming the alpha isn’t a problem unless there are other alpha’s there and the facility doesn’t have the space or processes in place to accommodate multiple dominant dogs. Submissive dogs might not like being part of such a big playgroup. If you’ve ever taken your dog to the dog park and he wanders off to sniff and do his own thing, a small facility with a lot of animals might be overwhelming for your dog. When a submissive dog becomes fearful and overwhelmed, he can nip and bite either workers or other animals. This doesn’t bode well for you, your dog or anyone involved. Start to pay attention to how your dog acts when he meets other dogs on walks or at the dog park. You’ll start to understand his tendencies so you can choose the right facility for your dog. You won’t be able to take your dog even for a meet and greet at a doggy daycare unless he is up-to-date on all shots and healthy. If a doggy daycare doesn’t ask you for your veterinarian’s health records for vaccinations that include a current kennel cough vaccine and Bordetella, you should find another. There should also be tick preventative measures in place. Illness spreads quickly among dogs because they are, simply put, in each other’s stuff all the time. Your dog’s health and safety should be concern number one for both you and also the facility. Be prepared with the right documents and expect the daycare center to request them before your first visit. Don’t enroll in daycare for dogs until you do your research. There is a lot of factors to consider when trusting anyone, including a large facility with your dog. While everyone is always concerned about the costs, think about some of the benefits you get with the higher fee locations. Costs vary widely for doggy daycare facilities. Expect to pay anywhere from $12 to $50 per day depending on where you live, the hours the facility offers and the extra amenities it provides. The more services a doggy daycare offers, the more expensive it will be. Many facilities offer monthly packages that allow owners to be flexible on daycare days but reduce the overall monthly costs to anywhere between $240 to $550 per month. The doggy daycare facility should be properly licensed and insured as a local business and adhere to local and state business laws. Every state and county has different guidelines and rules for state licensing. Ask the doggy daycare for a copy of its license and whether or not it is insured and for what types of losses. Confirm that the insurance covers you in the event that something happens to your dog while under the care of the facility. Negligent acts by owners, staff and other dogs (or their owners) need to be covered by the insurance. You need more than just a trip and fall insurance liability policy. Doggy daycares are not required to obtain a certification like a child daycare facility. This can make it hard for a dog owner to trust the establishment it works with. Pet Care Pros is one company that offers pet care certifications, but this isn’t required to open facilities. Ask the pet care facility if they have any certifications. Also, ask what training the staff members have. Are they certified dog trainers or handlers? Some might have training in a veterinarian’s office. You should also ask whether all employees are current on Dog CPR and First Aid certifications. This certification is offered by the American Red Cross. You have to know that even in the worst-case scenario such as a dogfight or unforeseen health issue that your dog is in good hands. Ask who the veterinarian on-call is for the facility. Facilities should have someone they use for any emergency. 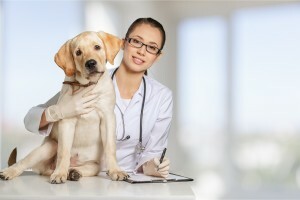 Look up the veterinarian and see if there are someone you would choose for your pet. 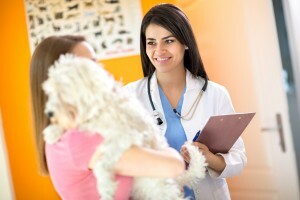 Even if the vet is next door, if this is a person that you chose not to make your dog’s primary care provider, you should consider whether the facility is for you. It’s always good to call the veterinarian. If your dog might be under their care, you should know their treatment philosophy and perhaps even set up an intake appointment just so they are familiar with your animal and have their file on record. You don’t need to change vets, but making sure the on-call vet can act in emergency scenarios according to your wishes and your dog’s history is paramount. The daycare fee associated with the facility will depend on the size, location and amenities offered. Expect to pay more for a facility that has more to offer. 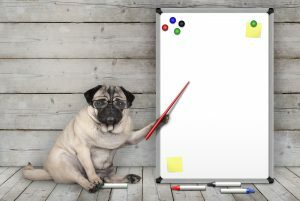 At the same time, densely populated urban areas where commercial real estate is quite expensive will also affect the per day cost of doggy daycare. Many doggy daycare facilities offer boarding options as well. This is good to determine at the start of your enrollment. Whether you travel a lot or just occasionally, a boarding facility where your dog already loves to go is nice to have. When your dog is familiar with the location and already associates it with play, there is less stress on him when you are away. This makes it easier for the dog and for any dog parent when traveling. After all, if you are going on vacation for some well-deserved fun, shouldn’t your dog be having fun too? Find out whether the doggy daycare facility has both large indoor and outdoor play areas. This is imperative in geographic locations where the weather gets extreme. You don’t want your little Chihuahua suffering in the freezing cold nor do you want your Husky to suffer in the desert heat. While this isn’t absolute in all areas, it is nice to know if the location does mix it up so dogs get a lot of exercise regardless of the weather conditions. Some dog daycare facilities have added amenities to make it convenient for pet owners to get more done in less time. Grooming is a common additional service. 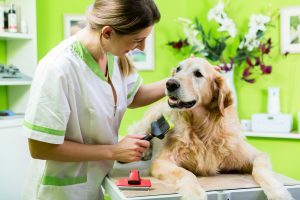 While grooming fees are always separate, there may be higher costs for a facility that offers it. Some facilities have dog pools or many different play sections for different size or temperaments of dogs. Small dog sections let the little ones play without fear from the big dogs. A section for elderly dogs allows them to get exercise without being overrun by highly energetic puppies. The facility may have an agility course as well where dogs can run up ramps and perform jumps. This is often part of training services in addition to daycare. Every daycare facility runs the routine a bit differently from check-in and check-out times to feeding routines and play periods. Ask whether your pet will be in an open space all day or does the facility kennel them for any portion of the day like feeding times. What happens if the pet shows anxiety or aggression? Where is the time-out area so they can start to feel comfortable and secure? How are fights broken up or dogs disciplined? These are important questions to ask. Find out how many staff members there are compared to dogs. It is recommended to not have more than 15 dogs per supervising staff member but the ideal ratio is less than 10. That means there should be one person per 10 dogs per area. Dog owners should never assume that a doggy daycare does things according to the recommended guidelines. Owners should feel comfortable that the dog is cared for, disciplined and treated in the same fashion he would be if he were home with family.